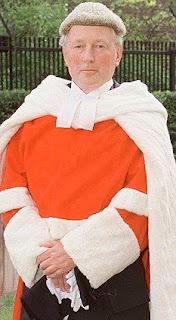 This blog has in the past had occasion to support Mr Justice Eady. But I was very disturbed to learn of his decision yesterday against the science writer Simon Singh. Singh - bestselling author of The Code Book - is being sued by the British Chiropractic Association, which claims that he defamed them in an article he wrote last year for the Guardian. While not a final judgement, Eady's ruling - described by legal blogger Jack of Kent (who was in court) as "astonishing and highly illiberal" - has the effect of wrecking Singh's defence before it has even begun. In the process, it not only threatens the writer with ruinous legal costs but undermines anyone who seeks to expose charlatanism and subject pseudoscientific claims to proper proof. Purveyors of superstition and exploiters of the vulnerable will now be confident that the law of defamation is on their side. In other words, chiropractice was bogus because there was no evidence to support it, not because its exponents were malicious. Moreover, as Jack of Kent notes, Singh's lawyer had "strongly emphasised" the passage in her oral submission. Unfortunately, "the judge did not take a single note during the oral submissions of the BCA, and he hardly took a note during Singh's submissions". He had made his mind up before the arguments even began, and the ruling appeared to go beyond even what the BCA had argued for. The decision effectively deprives Singh, not merely of his primary defence, but of any defence. Even if he proved beyond all doubt that chiropractic treatments were worthless, he would still have libelled the BCA. He can appeal, but preliminary rulings are rarely overturned in the higher courts. There is talk of taking the case to the European Court of Human Rights, but that would be time-consuming, expensive and of uncertain result. Nor is there much prospect of Parliament coming to the rescue. This is common law, and has always belonged to judges. JoK thinks that "there would surely be no shame in settling because of this bizarre and illiberal ruling on meaning". No shame, perhaps, but the ramifications for journalism, and indeed for public interest, would be severe. It would, on the other hand, be very good news for quacks. Or perhaps it just means - precedent being precedent - that we can't say "bogus" any more, and we'll have to come up with another word for piffle. Hard to say. But Eady, I fear, is no more a lexicographer than he is a scientist. Although a piece of journalism is not the same as peer-reviewed research, it is deeply disturbing that judges should consider themselves appropriate people to decide scientific facts - or that the archaic libel laws should be at all applicable in this area. English defamation law has always been a potential danger to free speech because it places the burden of proof on the defendant. It is only fairly recently, though, that lawyers have begun to exploit libel law to silence criticism of factual claims and exposés of pseudoscientific charlatranry. Where issues of scientific debate are concerned, in addition to the abstract principle of free speech there is a strong public interest in rigorous debate unaffected by fears or threats of libel writs. Science works by peer review, not judicial review. As "Ritbiter" puts it in the current Private Eye, "the scientific method consists of a researcher putting forward a new proposal and his or her colleagues testing the living daylights out of it without fear of the consequences". Singh mentioned the case of a 20 year old Canadian waitress who died of a ruptured vertebral artery in 1998 after a chiropractor manipulated her neck. This was "not unique". Ernst, he explained, had identified 700 cases of "serious complications" from the medical literature. "This should be a major concern for health officials," he writes. It's certainly the sort of information that should be put before the public. I'm beginning to understand why Private Eye thinks Eady is so dangerous. This is indeed lunacy. Anyone who describes homeopathy as a lot of unscientific nonsense might now be sued for telling the truth. But I'm baffled by it all, really. Aren't judges required (by somebody) to at least make a show of doing their jobs properly? Can't Eady be simply shown to have got it wrong? The problem is that judges and courts take it upon themselves to rule on matters of science when it is clearly outside their competence. Peter Huber's excellent, and only slightly dated, book Gallileo's Revenge details the pernicious effects this had in the USA. If you think that the job of British judges is to stifle the truth and protect the interests of the rich agains those of fairness then you will have no issues with this ruling. So by his own lights I am sure that Eady believes he is doing his job properly. What the heck is the right word to use about therapies that don't work? The fact that the BCA choose to go through the courts, rather than establish their case in the science journals, tells you everything you need to know about the strength of that case. Having slept on this, I'm beginning to think that Eady's perverse understanding of the English language does actually offer Simon a way out. The purport of the decision, as I grasp it is to remove the question of evidence from the libel action. If Eady had decided differently, Simon would have had to prove that chiropractic is bogus - quite a tall order, given the burden of proof and Eady's own form. But he no longer has to prove this. Thus he can "apologise" without needing to resile from his stern criticism of chiropractic - especially the more exaggerated claims that are made for it. 1) My intention in the article was not to impugn the honesty or integrity of the BCA, but merely to raise questions as to the scientific validity of chiropractic. 2) The judge has concluded that the words used suggested that the BCA was knowingly dishonest. Since this was never my intention, I am of course happy to withdraw those remarks in the sense in which they have been interpreted by the judge. 3) I reiterate, however, my belief that notwithstanding the bona fides of the BCA, chiropractic is scientifically worthless. That should avoid most of the "chilling effect" of the action, though it would enshrine Eady's bogus definition of "bogus" into English law. I thought Australian defamation law was sad (much of its biggest flaws were repaired in 2006) but Britain is fast becoming a laughing stock in this area. Chiropody is without doubt scientifically bogus and Simon Singh should 'apologise' for assuming that the BCA were intelligent enough to read any scientific papers or even a pop science book. Clearly they are not proven to be actively dishonest, just very stupid and pig ignorant. The judge can them award them 1p in damages and everyone walks away happy. If the same standards had been applied in David Irving's libel case, he would have romped it in. Charlatans of all sorts must be rubbing their hands in anticipation - any article exposing them, no matter how truthfully, is a potential goldmine.